Tropical, colourful and calming; the Lani collection of 100% natural, 100% vegan hair and body treatment products are now even more stylish with luxury packaging design. With a vision to match the vibrancy of the brand to its packaging, Lani turned to the expertise of packaging specialist Keenpac to bring its brand wrapping to life. Lani is a UK based company that specialises in tropical, natural, vegan and cruelty-free skin and hair care. The products are all hand-made in small batches every week to maximise freshness and to ensure every product is made with absolute care and precision. Only the highest quality, food grade ingredients are used – and the business avoids using any artificial preservatives, fragrances or chemicals. This means the Lani products are 100% natural, and 100% fabulous. With striking colour and tropical values the Lani brand is elegant and attention grabbing. The new retail box packaging by Keenpac had to capture this vibrancy and elevate the brand. 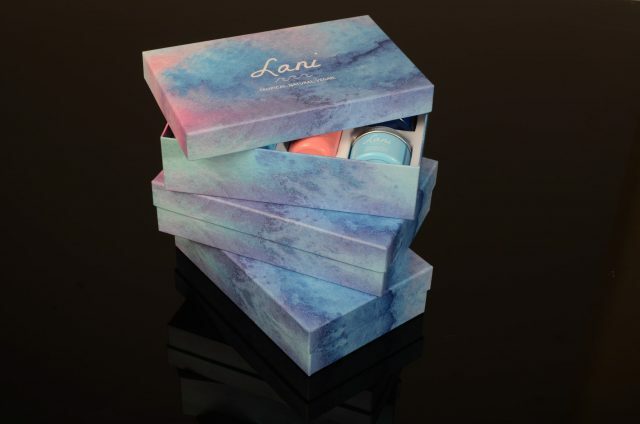 “Lani first came to Keenpac as their existing box packaging didn’t reflect the vibrancy of the brand and the box insert wasn’t fit for purpose. After sampling various styles we decided on a two-piece rigid presentation box produced using a rigid board covered with a coated art paper printed from CMYK with a reversed out white debossed logo and matt lamination. For the insert we used a bright white foam to really bring out the colour of the product and provide great protection at the same time.